Tucked up on a hill, overlooking the U.S. Steel Tower and the Cathedral of Learning, lives a lively hospital in Lawrenceville. 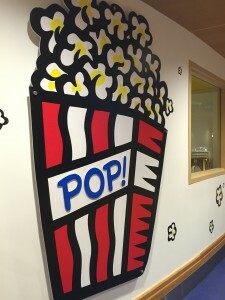 Children’s Hospital of Pittsburgh of UPMC is a whopping 1.5 million square feet, filled with patient rooms, research labs, office spaces, playrooms and more. 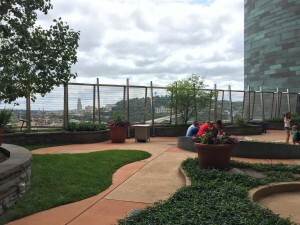 As the fortunate UPMC Summer Associate placed here, I was privy to all of the awesome spaces that Children’s Hospital offers. There are so many things that make working here special. 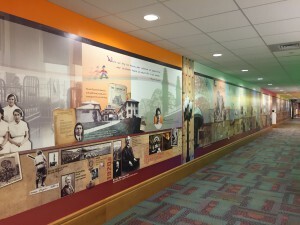 On the third floor of the hospital, right next to the cafeteria, sits the history of the hospital stretched down a long hallway. From its humble beginnings 125 years ago, to the expansion of the building, to the Lawrenceville campus that opened in 2009, the history wall takes you on a time-travel journey, allowing you to explore Children’s past. During my summer, I often searched the wall for facts we could use in press releases, and accompanied news anchors to the wall to tape interviews. The cafeteria (and Pop Stop!) makes my Top Five list without any question. Where else can you get made-to-order grilled cheese, fresh sushi, chocolate mousse, and pie any time you want?! It takes a lot of self-control not spend your entire paycheck on lunch every day – I’m getting hungry just thinking about it! Everyone can find something they like. If you have the honor of working here, don’t let the summer pass by without getting a few meals on campus. And, be sure to grab a milkshake (or four) from the Pop Stop. 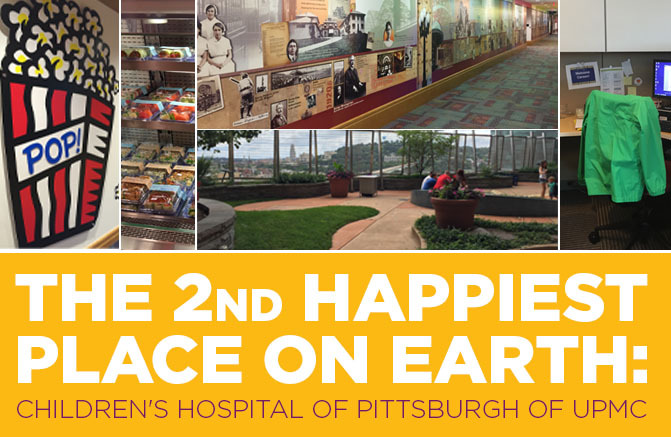 Head upstairs to the 6th floor to check out the Eat’n Park Atrium and the Howard Hannah Healing Garden. The atrium is home to tons of events at Children’s. It’s big, bright and full of lots of neat decorations. A huge projector screen drops down in front of the windows to turn it in to a movie theatre. When there isn’t a movie or baseball game playing, you might find Pittsburgh Pirate Andrew McCutchen creating art with some of the patients. I got to celebrate the kickoff of the 125th anniversary in the atrium, as well. The healing garden is directly outside the atrium. This balcony overlooks all of Lawrenceville. You can see for miles! If you ever need to stretch your legs and get some sun, I suggest heading to the garden. I’m lucky enough to have my own little home away from home here at Children’s – my cube! I’ve got my own phone, two (yes, two!) 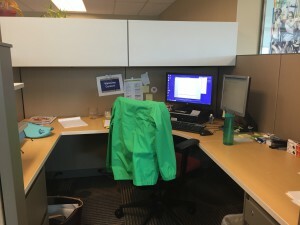 computer monitors, and lots of space to work. A couple of decorations and it feels pretty homey. I even have my name and title right out front. I love having my own quiet space to work. Last, but most certainly not least, are the people that have made my experience as a Children’s Marketing Summer Associate so great. My manager and colleagues have been incredibly helpful throughout the process. In fact, I was able to work with each of them on a variety of projects. They’re such kind, supportive, and fun people to work with. Whether they’re rescuing me from a locked stairwell (yeah, that happened), biking downtown to a meeting, or just showing me how to draft a flier, they’ve always been more than willing to teach and guide me. This summer would not have been the same without them. This summer at Children’s has been full of amazing experiences, and I’ve learned so much. It’s an amazing facility with awesome people. I may be a little biased, but I think it’s the best place to work!